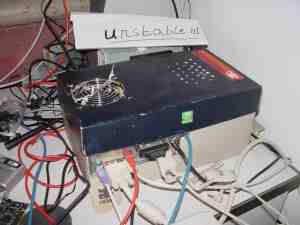 UNSTABLE.NL - \Un*sta"ble\ :: Electronic information tampers with your soul! girl looks upon a love letter"
``Individual Thought Patterns''; Sapere Aude! UNSTABLE.NL is a modest server that supports freedom and privacy. This server runs exclusively on Free Software, and nothing less. Free as in free speech, that is. It is also an experiment in energy efficiency, as its hardware is selected for modesty, not performance. It uses about 20 Watt, compared to 100 Watt and up for plain desktops and servers. This server is operated by Andreas van Cranenburgh, see my personal homepage. I can be reached at andreas@unstable.nl (GPG key), or with the same address on Jabber. This site looks best in elinks. Mini-ITX -- unstable.nl's cheap, small low-power hardware.